Each month, the U.S. Travel Association sends its members the U.S. Travel Outlook, which provides insight into the current state of the economy and related industry trends, plus other relevant data from the travel and tourism sector. Here are some of November 2018’s most compelling findings from the U.S. Travel research team. In September, the U.S. goods and services trade deficit grew even further, expanding 1.3 percent to $54 billion. Both imports and exports grew 1.5 percent in September, with imports hitting $266.6 billion—an all-time high. Exports hit $212.6 billion in September. “A bigger [trade deficit] reflects the stark reality that the American manufacturing sector is not as dominant globally as it once was,” said MarketWatch’s Jeffrey Bartash. 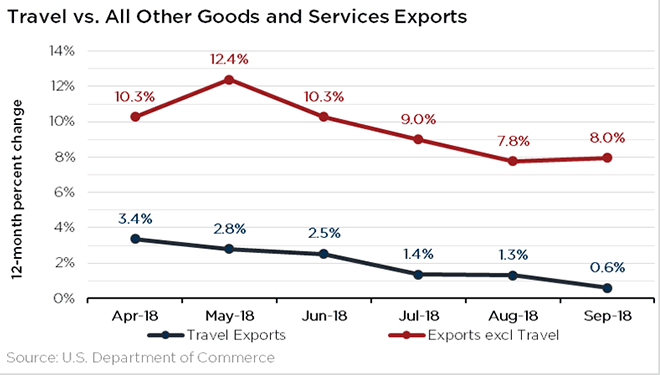 Travel exports expanded to $21.36 billion, while travel imports expanded to $15.66 billion in September. Without the $5.7 billion surplus provided by travel, the $54 billion overall September trade deficit would have been 11 percent higher. According to Expedia’s 18th annual Vacation Deprivation study, Americans are in serious need of a vacation: 59 percent of those polled described themselves as somewhat or very vacation deprived. Of the 19 countries studied, American workers took the fewest number of vacation days in 2018; Americans received 14 days on average and used only 10. 54 percent of those polled cited finances as the primary reason for not taking vacation days. AARP Travel recently released a study on the health and wellness benefits of travel. Those polled cited a number of health benefits before, during and after the trip: improved emotional well-being (54 percent), connection with loved ones (52 percent), amount of energy (35 percent), intellectual curiosity (34 percent) and mental clarity (30 percent). The latest study by American Express Meetings and Events should mean good things for business travel. The 2019 Global Meetings and Events Forecast expects North American meeting budgets to grow by 0.8 percent and overall activity levels to grow between 0.5 and 1.3 percent depending on the type of meeting. While Americans may not love traveling for work, a survey by TripActions found that 90 percent of business travelers see it as essential to driving company growth; 91 percent prefer to close a deal in person, even if it necessitates air travel. A deeper dive into the data and insights available in the November 2018 U.S. Travel Outlook—which includes the latest data on employment, transportation, inflation, consumer confidence and more—is online here. U.S. Travel Association members receive the full U.S. Travel Outlook, plus a myriad of other cutting-edge research reports with information relevant to the travel industry. Learn more about the benefits of becoming a member here—or simply continue to enjoy a small taste of U.S. Travel’s research insight each month here, with the Research Round Up.